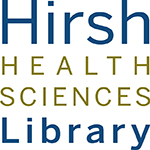 Currently viewing the tag: "floors"
It is April of 2016, which means now is a great time to look at the Hirsh Library School Affiliation Survey from March and see how it compares to the one from October. Let’s get started! First thing is first: PHPD has rocked up in numbers! Dental has traditionally been the most frequently counted school in this survey, but this is the first time that Medical has been dethroned as 2nd place. And look at the number differences: The difference from first to second place is 21 people, and the difference of second to third is 15. That’s ridiculous! We are very busy people here at HHSL. Medical keeps their hold on the highest circulation of the week. However, what’s truly interesting is the strong showing of the PHPD programs and Nutrition. Look at those numbers! As someone whose whole job revolves around circulation at this library, it’s very exciting to see the growing interest in all programs across the board. It is, generally, at this point that I go and show you something like a breakdown of the schools by floor. And therefore, I’m going to do that right now! The 7th floor is, undoubtedly, the monarch of the floors. Look at that. 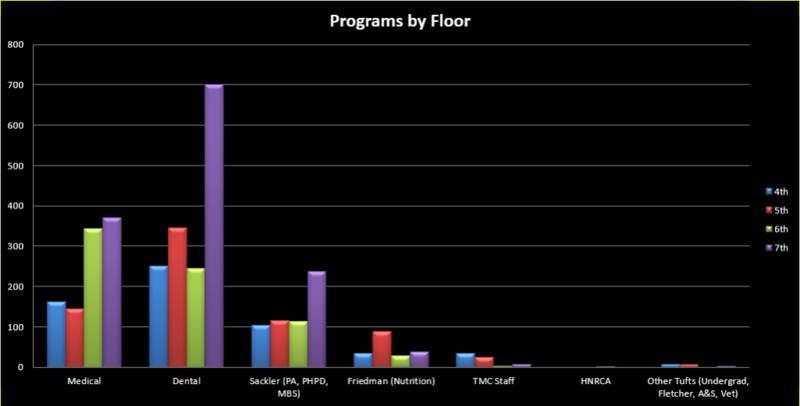 Medical, Dental (by a massive margin) and Sackler/PHPD programs (by a smaller but still strong margin) all love themselves the 7th floor. I still find it interesting, though, that for Dental it’s 7th and then 5th, but for Medical it’s 7th and then 6th. A difference in study habits, perhaps – Dental students might be more interested in group rooms, whereas the Medical students are looking for singular study spaces (like small tables and study carrels). It would account for the 7th floor’s popularity with both, and then the difference in second favorite. Nutrition seems to be much more interested in being able to talk – the openness of the 5th floor (and its collaboration rooms), followed by the room-heavy 7th. And this is where we run into a limitation with the way we’ve been doing this survey: combining PA, PHPD, MBS, and Sackler all into one category. We know that the MBS program has been growing each year, and we know that the PA program has been growing. And PHPD encapsulates a number of other degree programs. Sadly, until now, I haven’t been able to distinguish between them when looking at this survey. Going forward, however, I’ll be able to! We’re working on some back-end adjusting of how we collect all of this data, so that way we can be much more accurate across the board while going forward. After all, accuracy leads to knowledge, and knowledge is what we’re striving for here! I’m not sure anyone at HHSL was quite prepared for the way our numbers have exploded over the last couple years, so we’re playing a bit of catch-up in a few areas to make sure we can still serve the needs of our entire community! It looks a lot like that! That’s surprising, kind of. Right? I mean, that is a lot of people. A. Lot. I find it interesting that Medical and Dental jumped so high (Boards and the infamous Dental Exam Block probably had a bit to do with that), but the PHPD programs dropped a little, and Nutrition bumped up slightly. Now what about the floors? How do those look? They look busy is what they look like. Every single floor got busier! This, of course, comes as a surprise to absolutely nobody – it’s a well known fact that we’re busier in the spring than the fall (fun fact! Currently, October is the busiest month, followed by March, and February. April is traditionally the outright busiest of the year, however, so we’ll have to see how things turn out). But still, it’s kind of cool to see that each floor went up by just about the same proportion across the board. That’s ridiculous. That’s not supposed to happen in the real world! And yet, here we are. As you may have realized by now, I deal with a ton of statistics during the year. The red bars you see above most closely resemble the regular, month-by-month bell curve of how busy each day of the week is. The busiest day of the week might shift a bit between Tuesday, Wednesday, and Thursday, but in general? It looks like that. Like a bell curve. But the blue! October did something unique, and dipped right in the middle of the week. It’s worth noting: neither of these weeks had any major exams, and neither week had any holidays. They were chosen for both of those reasons. Perhaps that Wednesday in October was unseasonably nice, and everyone just really needed to be outside? Can’t say I blame them. So there you have it! Our Affiliation Stats round-up. 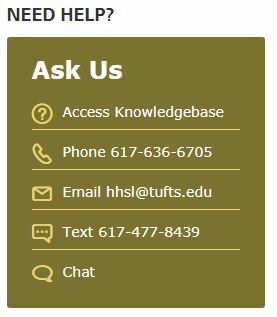 I’m already looking forward to doing some of the year-end numbers, and finding out just how crazy busy HHSL has been in the 2015-2016 academic year. Now if you’ll excuse me, I need to go look at something other than Excel for a few hours. Perhaps a few days.